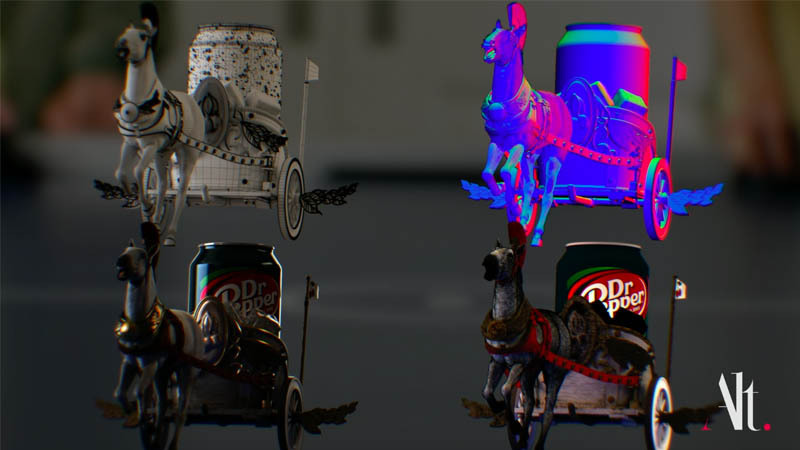 Alt VFX recently created a tiny miniature horse-drawn charriot for Dr Pepper commercial. Creative team at Alt VFX sculpted the talking horse and its Roman-style charriot in 3D, then used extensive grooming, lighting and texturing to ground it in reality. Animation team then studied hours of reference material, looking at the subtleties of movement a horse makes when trotting, galloping and resting, and then applied these to our 3D horse. Alt VFX team used compositing techniques to place the horse and charriot into the live action plates. “We made a tiny horse,” said VFX Supervisor Nick Lines.